PUMPKIN EVERYTHING!!!!!! We’re about to get our pumpkin on, again! So what’s the big fuss about all the pumpkin recipes? Well, besides the fact that it’s absolutely delicious, pumpkin is packed with nutritional benefits! 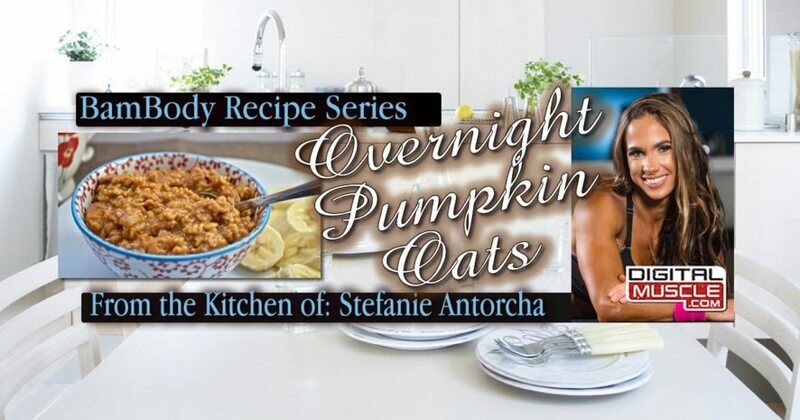 Combine oats, 150g pumpkin, seasoning, water and stevia in medium sauce pan and heat until boils. Turn off heat and add in egg whites. Now you need to stir vigorously so that the eggs don’t cook unevenly. Keep stirring until mixture is thick. Pour into bowl and sprinkle with pumpking pie season on top. Let sit out about 30 min, then add remaining 50g pumpkin on top. Place in refrigerator overnight (or if you are in a hurry put in the freezer for 20 min.) In the morning you have an amazing treat to start your day!!! If ya’ll want to see more pumpkin recipes… LET ME KNOW!!! Believe it or not pumpkin is so versatile and can be made sweet, salty, or even somewhere between!!! Till next time!